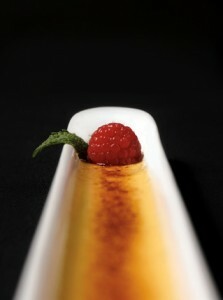 Madagascar vanilla bean crème brûlée at Baru 66. Nearly a year has passed since I wrote my last column as The Des Moines Register’s restaurant reviewer, a position I held for nearly 15 years. During that time, I spent my way through well over six figures worth of food, ate my way through more than 2,000 visits to restaurants, and wrote more than 700 reviews and articles. What a ride! I witnessed everything from the fall of iceberg-only salads to the rise of arugula. I saw chef-driven, seasonal cuisine edge out steak and prime rib for our fine-dining dollar. The pizza and sushi renaissance, the farm-to-table movement, the evolution of artisanal cheese, the explosion of Southeast Asian restaurants—all happened on my watch. I looked on with joy as Centro coaxed crowds back downtown and listened with glee while words like risotto, foie gras and charcuterie became part of our dining vernacular. I bore witness as locally owned Mexican restaurants chased corporate Mexican chains right out of town. I saw small plates become a big deal. Now that the dust has settled on my Register tenure, it’s a challenging, yet enjoyable, task to unveil the restaurants that endure as my favorites—restaurants that have stood the test of time long after the stars were handed out, restaurants where I have spent my own money long after my expense account was closed down. I’ve limited the focus to locally owned Des Moines-area restaurants (sorry, Lincoln Café), and I omitted casual restaurants without table service (love ya’, Gusto Pizza Co., but I had to draw the line somewhere). And (with apologies to The Art Center Restaurant and Flarah’s), I omitted lunch-only spots. Here’s my list, then, of dinner-worthy places that combine food, service and sufficient ambience for a complete dining experience. They’re my top recommendations for places that I feel are worth of a piece of your paycheck—and an evening of your hard-won leisure time. The top three are listed first, followed by the others listed in alphabetical order. Butter-poached lobster with carrot mousseline, hollandaise sabayon, La Quercia prosciutto crisps and sesame tuile at Baru 66. If you dine now and then in progressive high-end restaurants, this has probably happened to you: On the menu, you spot something like a parsnip panna cotta with a foie gras torchon and red currant gelée. You’re intrigued, but you wonder if the chef can truly pull off this kind of thing. Should you roll the dice or stick with the steak frites? Rest assured, David Baruthio can pull it off. Then, he’ll fuss and finesse until his creations live up to his pedigree and ambition. Classically trained, globe-trotting Baruthio has cooked all over the world, from a Michelin-starred restaurant in Belgium to a five-star hotel in Mongolia, with stops in Beverly Hills, Canada and the U.K. along the way. Though Baru 66’s menu offers plenty of straightforward presentations (yes, you can order steak frites), culinary explorers should go for the tasting menus, where Baruthio’s dashing, multi-ingredient cuisine performs neat feats on most every plate. 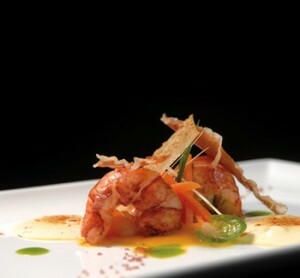 What can sound disparate on the menu harmonizes exquisitely on the palate. So when you eye something like “millefeuille of savory graham crackers, caviar and lobster gelée, with white chocolate foam,” nab it—with confidence. Full disclosure: In recent months, I’ve been working with husband-and-wife co-owners David Baruthio and Sara Hill on projects in conjunction with my French cookbook. But rest assured that Baru 66 does not get the “best” ranking because of our collaboration; rather, I collaborate with Baru 66 because it’s the best restaurant in town. Alba owner-chef Jason Simon continually creates inventive combinations of uncommon produce, offbeat grains and full-flavored meats. I vote Alba “Des Moines’ Least Cynical Restaurant.” While many chefs lowball our palates, joylessly piling on safe and predictable players (garlic mashed potatoes, anyone? ), Jason Simon has enough faith in our tastes to roll out the likes of farro, kohlrabi, beet greens, red chard and rutabagas. Night after night, Simon and crew serve up colorful tumbles of market-fresh produce and offbeat grains, often starring them in uncommon ways. But this isn’t mere rabbit food. The kitchen shines at its best when it crosses the deep flavors of rich meats (wild boar, duck, short ribs) with the sparkle of something startlingly fresh—pickled cherries here, a carrot-juice reduction there. With this modus operandi, a gratifying bacon-and-cheese-stuffed quail becomes illuminated by the brilliant flash of fresh peaches. Every time I go to Alba, I’m struck by the reasonable prices—food this imaginatively detailed would set you back much more in a big city. Alba also fulfills the quest for the casual-but-not-boring Tuesday night dinner. Head to the lively lounge for chef-driven burgers, such as the Korean pork burger with kimchee and a fried egg, or a thoughtful spread of appetizers. When Alba opened in 2008, some found its urban-edgy atmosphere a bit blunt, but I’ve always liked the dreamy effect of the vintage wooden doors floating overhead and the sparkle of the streetscape outside the curved windows. Besides, these days, the room swells with the warmth and verve that only a contented crowd of food lovers can bring. A 16-ounce rib-eye steak, served with baked creamed spinach and scalloped potatoes with truffle cream and Gruyere cheese, at 801 Chophouse. How many times have you watched $100-plus fly from your wallet for an inexpertly served, fine-but-nothing-great dinner for two? At such times, I vow to skip the amateurs and hold out for a major splurge, which is to say, I’ll gladly spend $200 to dine at 801 once rather than $100 to dine at a lesser restaurant twice. Step into the polished entryway, and the luxurious aroma of beef and martinis sets the tone. With etched glass, leather booths and gleaming wood underneath the soaring ceilings, the dining room exudes Edwardian grandeur, and the servers possess poise and polish—yes, you can trust them to finesse your big-time clients. you can add special preparations, such as a bone-marrow bath or a bit of foie gras. Although most entrees are priced and sized for business people on expense accounts, don’t be shy about ordering a split plate. And always split the sides—in my experience, you won’t be treated any less regally for doing so, there’s no split-plate fee, and you’ll leave feeling thoroughly gratified. 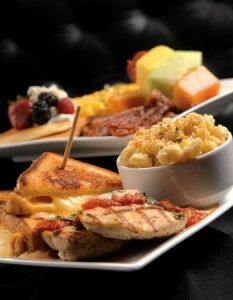 Americana Restaurant & Lounge’s weekend “Bombshell Brunch” offers a build-your-own grilled cheese sandwich bar and plenty of other options, such as macaroni and cheese and chicken Parmesan, as well as more traditional breakfast choices. The Draw: This stylish two-storied restaurant races neck and neck with Centro as the downtown spot to see and be seen. The menu attempts quasi-edgy and often global takes on favorite American bar-grill food (goat cheese on the nachos, for instance). Many dishes are rich and heavy in a way that makes many Iowans happy, though others might yearn for some subtlety and restraint now and then. Don’t Miss: Iowa chops served with a lovely sweet-corn sauce. Weekends, find one of the more compelling brunch buffets in town. Mary Pappajohn Sculpture Park across the street. The Draw: Among the generous handful of French restaurants in town, Bistro Montage distinguishes itself by getting to the heart of the corner-bistro experience. Here’s where to head for straight-on classics like steak frites (with hand-cut fries) and pan-seared skate with brown butter; better yet, their preparation is overseen by a seasonally entrenched, classically trained chef-owner. With its rich red walls, true-to-France banquettes and storefront windows looking out onto the avenue, it’s a cozy yet energetic spot. Don’t Miss: Skate, scallops, short ribs. For a casual dinner, enjoy crêpes with a salad for less than $15. Good to Know: There’s no sticking it to you on the wine prices here: Admirable, inexpensive wines start at $4 a glass. Thursday is corkage-fee-free night. The Draw: Everyone has a favorite Southeast Asian hole-in-the-wall. This is mine. The East Side strip-mall spot can be relied on for good, super-fresh Chinese and Southeast Asian food. Look past the secondhand furniture and groove to the boldly painted red walls, mod ’70s mirrors and upbeat youthful crew members who prefer electro-pop music over traditional Asian folk strains. Don’t Miss: Fuzion appetizer platter, Furious Catfish, green curry and a Mongolian beef that bests most in town. Good to Know: This spot charms most when enjoyed at dinner with a group of friends. Order a slew of dishes, bring your own wine (no corkage fee! 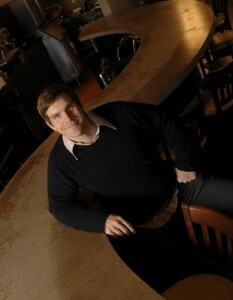 ), and eat, drink and chat your way through an inexpensive, lively evening. The Draw: Yes, sometimes I roll my eyes at the kitchen’s obvious ploys to bulk up the plate (more garlic mashed potatoes and fettuccine Alfredo than anyone should ever eat, for instance). Yet while generosity trumps finesse at most every turn, the good-time buzz at this downtown crossroads can’t be beat. Night after night, the room swells with le tout-Des Moines, and everyone seems to be having a fine old time. Don’t Miss: Italian meat-and-cheese plate, cheese-and-prosciutto-stuffed chicken, Mama’s Meatballs, pork chop Milanese. Good to Know: The wait-staff understands that portion control is not the kitchen’s strong suit and will graciously split entrees. Just be sure to make it worth their while when calculating the tip. The Draw: This been-here-forever Italian-American venue pulls off a neat trick that few old-school restaurants manage to do: Now and then, they inch forward into more contemporary territory (with dishes like olive chicken), without losing the reason everyone’s always loved this spot (classic spaghetti and meatballs, terrific prime rib, for instance). The lounge endures as a great stop for an easygoing, any-night bite, including stone-oven-baked pizzas and expertly oozy sandwiches. Don’t Miss: Spaghetti and meatballs with half red, half white sauce; oven-baked ribs; pan-fried walleye; prime rib. Good to Know: Order before 7 p.m. for the Petite Portion Menu. Plenty of food will come your way for $8.25 to $18.95, including salad. The Draw: Almost any one of our Thai restaurants could have made this list, but where some stint on décor, Cool Basil pulls out ahead. The spacious, angular room is airy, comfortable and colorful, with contemporary artwork and lightly shaded windows that let natural light brighten the room. Find fresh, engaging takes on all your favorite curries, noodle dishes and stir-fries. Don’t Miss: Pad Thai, green curry, Tom Ka Kai, Eggplant Lover. In summer, try the marvelous main-dish salads. Good to Know: Wine lovers will appreciate the thoughtful wine list. The Draw: Sure, you can find plenty of places that serve less-expensive Mexican food, but none that parade the dashing and contemporary Latin vibe found here. In summer, seek out the patio: With its contemporary hacienda-esque furnishings and compelling views of our 19th-century courthouse, you’ll feel like you’re on vacation in some exciting elsewhere (especially if you order one of the expert margaritas). The menu toggles between well-known Mexican faves (tacos, enchiladas, et al.) and more inventive dishes, like a pork chop with Swiss chard and mango-habernero sauce. Don’t Miss: Mahi-mahi tacos, marinated skirt steak with chimichurri sauce, Devil Shrimp, and tableside-mashed guacamole. Good to Know: Pay attention to the daily drink specials—on Thursdays, for instance, the barkeep brings on admirable margaritas for $4. The Draw: All hail Django for taking the intimidation factor out of French dining once and for all. The downtown brasserie rolls out the same good-time buzz as does Centro, its sister restaurant up the street. Let’s not get our coulottes in a boule, then, if the food can veer into the “bigger is better” realm, favoring heft over finesse. There’s plenty here for everyone, from thoughtful (and somewhat refined) daily fish specials to anything-but-subtle poutine (beef, cheese curds and demiglace over french fries). Don’t Miss: The finely detailed, beautifully presented charcuterie plates; blue-cheese mussels with fries; and the Burger Royal (with fried egg on top). Good to Know: There’s never a corkage fee here, ever, so pick up a bottle at Gateway Market (which purveys good, inexpensive French wines) and head on down. The Draw: Great barbecue abounds in this town, but head here when you’re hankering for a complete dining experience: specialty cocktails, passionately purveyed beers and wine, a jazzy atmosphere and committed service. In addition to barbecue, you’ll also find Cajun, Creole and Caribbean specialties, though I’m always happiest when I stick with something from the smoker. I also appreciate the great range of goods—sometimes you want to pony up for a full slab of loin back ribs; other times, a $10 brisket sandwich will do just fine. Don’t Miss: Memphis-style ribs, smoked brisket and the Jennie Salad, which stars brisket with apples, red onion and peanuts. Good to Know: Occasionally, the restaurant turns into a mini concert hall for visiting blues acts. 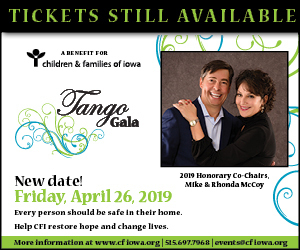 Visit the website for details. The Draw: Often, restaurants go downhill after long-standing owners hand over the keys. But when veteran employee Marty Scarpino took over Jesse’s Embers a few years ago, he gave the beloved Ingersoll venue a much-needed spiffing-up. Yet Jesse’s still offers all the charm of the quintessential midcentury steakhouse: comfy booths, captain’s chairs, snug bar and all. Scarpino also added a few Italian specialties to the menu, though great steaks remain the main draw. Don’t Miss: Embers prime 12-ounce sirloin, bacon-wrapped filet mignon, the Emberburger. Good to Know: The steak sandwich brings the same high-quality beef as the signature Embers prime 12-ounce sirloin, but in a smaller (and less-expensive) portion. The Draw: If you’re tired of lowering your expectations for food every time you head to a sports bar, give one of these barbecue spots a go. All three pull off a casual, offbeat groove while keeping the standards high for food and service. The restaurants specialize in boldly flavored smoked meats (plus steaks in Altoona and at the Drake location and Cajun/Creole creations in the West Des Moines outpost) and uncommonly good homemade side dishes. Don’t Miss: Brisket, pulled pork, the smoked-then-fried wings, and the hand-battered, white-cheddar-filled fried cheese. Good to Know: Platters for two can serve three and maybe four, especially if you also order some of those amazing wings and fried cheese to start. The Draw: Don’t be fooled by the word “dive” in the name. Though the simple décor of soft banquette seating, handsome high-top tables, and scores of bottles on wine racks may attract a casual crowd, there’s nothing loosey-goosey about the refined comfort food and well-purveyed wines found here. Whether you nibble through a tableful of thoughtful appetizers and enticingly topped flatbreads or go the full dinner route, the menu veers well off the beaten path, while still offering Iowa-friendly heartiness and any-night-appropriate prices. Don’t Miss: Oysters Louie, four-pork gnocchi, tomato-fresh mozzarella flatbread. For dessert, the straightforward, grill-your-own s’mores are almost too much fun. Good to Know: Take advantage of the lively, well-planned patio in the warmer months. The Draw: If your kind of Italian food is more about risotto and gnocchi than spaghetti and meatballs, then this is your place. Lucca also gets my vote for the No. 1 spot in town where you’re least likely to encounter diners in sweatershirts and baseball caps. Stylish in an exposed-brick, minimalist-urban kind of way, the restaurant attracts a dashing clientele. The New Italian menu deftly pulls off food that can best be described as “refined-rustic”—it’s never fussy yet rarely ordinary, either. Don’t Miss: The feather-light gnocchi, expert polenta and creamy risotto. Good to Know: Though ordering the three-course prix-fixe menu is encouraged, the staff will graciously let you order à la carte, especially if you sit at one of the lovely high-top tables in the bar area. The Draw: Let’s face it—the all-you-can-eat Chinese buffets downgraded Chinese cuisine in this town. Very few solid order-from-the-menu classic Chinese restaurants still exist, and even fewer offer a pleasant ambience in which to enjoy it. The Mandarin Grill is the exception. Enjoy fresh-from-the-wok versions of Chinese classics amid a contemporary décor that gleams with dark-wood furnishings and swish-patterned fabrics. Don’t Miss: Pork pot stickers, “Kung POW!” shrimp, Mongolian beef, General Tao’s chicken. Good to Know: Some dishes bring those little dried red Szechuan chilies. Beware: they’re killer-hot, but believed to release mood-enhancing endorphins. After gingerly nibbling on one—and sailing sky high—I’m a believer. 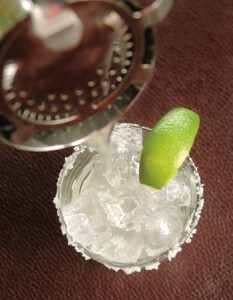 Served in a shaker, Mi Mexico’s margarita is arguably the best in town. The Draw: If you’re seeking the sort of fresh-and-simple Mexican fare that you get at taco trucks, this isn’t your spot. Rather, this is where you go when you want hearty and filling fajitas, burritos, combination plates and other on-the-beaten path Mexican specialties. So, how does Mi Mexico distinguish itself from all the other places that serve similar food? Two ways: The handmade Originale Margarita (served in a shaker and arguably the best in town) and the cheerful atmosphere of color-splashed furnishings, brick arches and tiled tables. Don’t Miss: Enchiladas Suizas, Camarones al Mojo de Ajo, tamales. Good to Know: With plenty of long tables, this is a good choice to inexpensively gather family and friends (I’ve celebrated a few birthdays here). The Draw: In recent years, sushi has become a cause célèbre, with hipsters piling into the next hot spot to sip jewel-toned neo-martinis alongside the sashimi and nigiri. Yet when you tire of places that are more about the Saki Bombs than the sushi, head to Miyabi 9, where Mike Miyabi consistently turns out perfect packages of freshness and intrigue. Thanks to the energetic East Village ambience—with its neo-urban unfinished look—the cool factor soars plenty high here, too, which is to say you can enjoy both great sushi and a happening scene. Don’t Miss: Shrimp and vegetable tempura, Sumo salad (with calamari), mussels sushi, cucumber-raw scallop roll. Good to Know: Don’t turn your nose up at the plum wine—yes, it’s sweet, but with a lightly sour backdrop that meshes well with sushi. The Draw: Hard-core foodies may raise an eyebrow at Noah’s spot on this list; its old-school red-sauced pasta rarely ranks high with bicoastal transplants and the polenta crowd. Yet Noah’s snags the top spot on my short list for a late-night pizza, a glass of Chianti and a chance to reconnect with my husband at the end of “one of those days.” Settle into a booth in the dining room or grab a table in the charming Fireside Lounge, with its retro-style sunken bar—and let the place work its reassuring midcentury magic on you. Don’t Miss: Homemade dinner rolls, ravioli en casserole, fried chicken with real whipped potatoes, pizza (my favorite: the Naples Margarita Pizza with sausage). Good to Know: Dinner salads rarely excite; substitute a homemade soup for something more homespun. The Draw: Chef-owner Sean Wilson and sous-chef Hal Jasa plate Mediterranean-inspired food in thoughtful and progressive ways. Enjoy anything from a casual lamb-burger with goat cheese to imaginative takes on pasta (such as scialetielli with green onion pesto, mushrooms, fennel, pistachios, chilies and pecorino). Some creations, such as the beet salad with a balsamic marshmallow, even take an ambitious leap into the realm of molecular gastronomy. Enjoy it all in a chic-and-sleek atmosphere, with views of downtown Des Moines sparkling outside the vast storefront windows. Don’t Miss: Charcuterie and cheese plates, roasted bone marrow, and that impossible-sounding (yet sublime) beet-balsamic marshmallow salad. Good to Know: As of press time, all dinner options were priced under $20. That, combined with sane wine prices (starting at $6 a glass), makes this arguably the best polished-casual option in town. 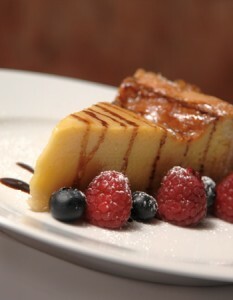 A French coconut tart baked in a sugar cookie crust at Sam & Gabe’s. The Draw: With live jazz noodling through the candlelit lounge and steaks and pasta crowding the menu, Sam & Gabe’s takes its inspiration from the supper clubs of yesteryear. Yet make no mistake: This thoroughly up-to-date restaurant, with its contemporary photographs and artwork, dark wood and natural light—and popular local musicians like Fred Gazzo and Tony Valdez—firmly entrenches the fun in the 21st century. Enjoy great beef as well as handcrafted versions of Italian-American and Northern Italian dishes. 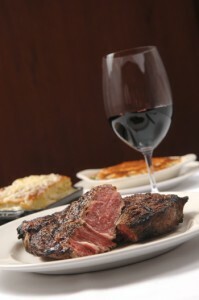 Don’t Miss: Cannelloni, five-cheese stuffed chicken breast, steak de burgo and, come the weekend, prime rib. Good to Know: Tuesday through Thursday, enjoy fabulous thin-crust pizzas in the lounge for $12.95. crowd make the downtown venue worthy of a major date night. You’d be forgiven if you always stick to the fish and shellfish (which generally arrive expertly cooked and glistening with the sea’s sparkle); however, red-meat-lovers will find a limited selection of steaks and chops. For a more casual bite, swing by the raw bar and nibble your way through oysters and appetizers. Don’t Miss: Chilean sea bass meunière, Alaskan king crab, raw oysters, oysters Rockefeller, Kung Pao calamari and shrimp. Good to Know: Although you’re never hit with a corkage fee here, the wine list is thoughtful and reasonably priced enough that you’ll do just fine leaving your bottles at home. The Draw: Tursi’s Latin King reigns as one of the most consistent venues in town. I’ve never experienced an off night here. The Italian-American menu is vast, and you’ll likely never work your way through it—the King is the type of place where once you seize upon a favorite dish, you have a hard time ordering anything else. Though many habitués pile in for classic red-sauced pasta, the signature dishes—including the famous chicken Spiedini—also draw fans. Don’t Miss: Chicken Spiedini (bread-crumb-coated marinated chicken brochettes), shrimp Angelo, and arguably the city’s best steak de burgo. Good to Know: If you have a light appetite, order the shrimp Angela appetizer and a potato croquette (instead of the shrimp Angelo entrée). Same thing, but a lighter portion. Wasabi Chi’s Des Moines Monster Roll consists of spicy smoked crab, mango, cucumber and salmon, topped with honey miso sauce and Japanese spices. The Draw: South China-born and Bangkok-trained chef-owner Jimmy Zheng worked in New York City restaurants for 15 years before moving to Iowa, and he’s attracted some notable talent, in both front-of-the-house and back. Bold, dashing colors and modern furnishings energize the décor, and the dark candlelit lounge is especially inviting. Though inconsistency plagued me on one past visit, the service, sushi and house signature specialties generally outshine the local peers. 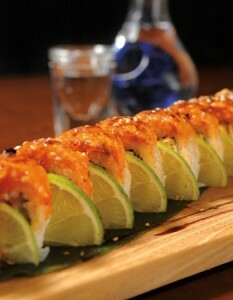 Don’t Miss: Spicy Girl Roll, Des Moines Monster Roll, Grand Marnier jumbo shrimp. Good to Know: In my experience, the kitchen’s talents showcase best with the more inventive, one-of-a-kind dishes; that is, don’t settle for Mongolian beef here. Please explain why you left Cafe di Scala off this list. Shocking. I must agree: Cafe di Scala outdoes a good half the list, in so many ways, from salad to dessert, from bread to wine. Very good article. I will be dealing with some of these issues as well. I am so excited that Wasabi Chi is included on this list! It’s unassuming curb appearance and location in one of the older parts of the newly revamped Merle Hay area may initially turn some people off – but once you have their sushi, you understand! This is a gem of a find away from the downtown sushi restaurants. Tons of new specials every day and great ambiance in the main dining area.